I have a confession to make to my fellow special needs parents. This evening, I broke one of our unspoken cardinal rules: I let my mind wonder what it would be like if my son wasn’t severely disabled. Twelve years plus into this journey and I know better, but something came over me tonight when I was getting him sorted in his bed. I lost control and it happened…my mind wandered into that place that can only bring sadness and heartbreak…that place of imagining him with no brain damage, no resulting disabilities, and completely healthy. If only that microscopic, common virus (CMV/cytomegalovirus) didn’t enter my body while I was pregnant. If only that virus didn’t cross through the placenta and into his just developing body. If only that virus didn’t attack his brain just as it was forming in the first trimester. I wondered would he be smart or sporty or both. Would he be well mannered and kind. Would he be interested in maths or science or literature or what subject, if any. Would he be affectionate and open or quiet and shy. Would he love me as he does today as he is now. I wandered where I shouldn’t have and I wondered far too much. I looked back down at him when, with his much loved laughter, he brought me thankfully back to reality. You see, as difficult as this reality is, wondering what it would be like if it were different is even more difficult because that reality can never happen. I used to have dreams when he was little about him walking and talking, and I would always wake up sobbing. As the years have passed, those dreams simply don’t happen anymore. I think that reality seems to have a way of invading even our dreams. But, I also think that it is for self-preservation, for if we let our minds wander into the land of what can never be, we risk losing our footing on this frequently rocky path. Even the toughest of warriors can be so terribly fragile that they risk breaking. My son Brendan Bjorn is one such warrior. I cannot stop it from happening, even though I would give my own life in exchange to do so. I cannot allow myself to break, although that is exactly what I feel like I am doing. I cannot give up, because he is depending on me to keep him safe…and to keep him alive. I cannot understand why life has to be such a struggle, such a constant fight just to live a life. Sometimes, life is too fragile and, in all honestly, I wonder what the point of it is. Yes, I know, there is a point, but I am nothing if not open as I unwisely wear my heart upon my sleeve or in this case upon my pages of writing. So, in all honesty, there are times – especially recent times – and moments such as these, when I am taken aback by seeing my beautiful son’s increasing fragility, and I am left contemplating the very fragility of life itself. Tonight, he had a short seizure, and again I was reminded of his fragile condition (as if I could ever forget) watching his body so cruelly betray itself once more. My tough warrior, who is so terribly fragile that he risks breaking, is now resting peacefully in his bed while I sit here trying to keep my eyes open until his Dioralyte fluid finishes its run. And as I think back on this week and all that was in it, I know that no matter how fragile life is, I cannot give up. Declan, my youngest son, is only 8 years old. He will turn 9 in May, although I think he is 9 going on 29 at times. His life is unlike most boys his age, and to be sure, so is his view of the world. In those short 8 years, life’s experiences as a brother to a severely disabled, medically fragile – and palliative – older sibling, have provided him with opportunities to develop his innate sense of compassion and empathy. And while he is the younger brother, he has clearly taken on the role of the “big” brother as he lovingly tends to Brendan’s needs. In the past few months, Declan has said some tremendously insightful, wise-beyond-his-years comments. I asked him to actually write this piece for me (because much to my pleasure, he is proving himself to be quite the great little writer! ), but he said he’d rather talk to me and I can write it out for him. Fair enough, I thought, he is only 8 after all! So, I recorded our conversation. What follows is a direct, unedited, transcript of his words. He wants people to understand our life, his life, and what Brendan Bjorn means to him. I want that, too. “So Brendan is more special than any of us. I mean, what’s the chance you’d have a son? Sometimes you can’t because it could be too late and other reasons. Brendan’s a rare child to have and he even teaches us things. He’s really special. He’s different to all of us. Well, we all are different, but he’s more different. He’s more different than really anyone – that’s what makes him special. He has broken bones in certain places to show how much CMV has gone in him. But he still does teach us things. It’s a hard life for me and you, Mom, because really we have to work with Bren, we have to do so much for Bren, so it’s just really hard to do lots. Well, sometimes we can’t get in certain places it would be hard and we even have to buy ramps that cost so much and we just have to buy them. There’s always just a problem all the time. We get one problem out of the way, there’s always another problem and we just still try to sort it out. And then it’s just really hard to deal with Brendan…I’ve always wanted a brother that I can play with and I really can’t but it’s just hard that I can’t because like I’m sometimes lonely at times because you always have to do the work with Brendan and I understand that you have to do that but yet again it’s hard that I can’t play with Brendan. And we have to buy him a wheelchair that sometimes people who just broke their leg would need it but we need it for a serious condition because just normally if you broke your legs you would just have legs that would hurt bad, but everywhere on him hurts. He’s different from us. Sometimes people don’t like people that are different. He is really different. Some people don’t like that we’re all different but that’s what’s good about us – we’re all different, we have different personalities. Brendan really just sits in a chair all day but it’s just not fun for him at times, yet again we always do come up to him and play Nemo and we get stuffed toys for him. He is happy with the life he has now because like there’s no turning back to having a different son so we have to stick with the same one. I’m not saying that I do want a different one – I mean he’s perfect the way he is. Everyone is perfect the way they are. Because even if you’re really different you always know there’s something really fun to someone else. I think [our family] is fine, I’m used to having this family, anyway I still like this family and there’s no way that I wouldn’t like it because Brenny is really nice. Even though Brendan can’t walk or talk, he is still my brother to me, he can still show affectionate love even though he can’t really say it, but he can show it, it’s really just like sign language where you don’t talk and that’s really what he does but he can’t move his arms. Because when he looks at you, he knows that you want to, and when he laughs and smiles at you that means that he wants you to come over to him. So, the thing is about him is that he is really different and that’s what’s good about him. I like that people are different but he’s really different and that’s what I find really fascinating about him is that he’s different and not much people have this. It’s rare to have them and even not much people have it so they don’t know how hard a life it is. And with that, we ended the talk holding each other and crying, talking about our little family and how we will always be there for each other, through it all. The tears flowed as freely as the love. Caring for the most vulnerable in society can actually result in you becoming very vulnerable as well. The sacrifices a carer makes physically, emotionally, financially, socially, and in so many other ways, is not fully understood – nor respected – by the majority of society and especially not by most governments. Those sacrifices we make in order to care for our loved ones who cannot care for themselves comes at a very high price on all of those levels. It is a price, which left too long without proper assistance, can easily become no longer sustainable. Once upon a time, things were so very different. Once upon a time, I was a professional. I even had my own business cards complete with my degrees after my name and the job title below my name. Now, I’m lucky if I remember my own phone number or what day it is. Once upon a time, I worked my way through college, and then years later worked full time while I put myself through graduate school. Driven and fiercely independent, I devoted myself to reaching my educational and professional dreams. Now, I’m lucky if I reach the goal of sorting out all of my son’s medications and putting them on the shelves where they rightly should be. Once upon a time, I used to ride my bike to and from college, and on the weekends I would go hiking for hours on end. I was fit, strong, without a physical care in the world. Now, I am overweight, too often struggling with depression and anxiety, and live daily with chronic pain from arthritis (rheumatoid and osteo), degenerative disc disease, and a fairly severe bunion that will require surgery for the pain to finally end. Once upon a time, I owned a house that I adored. I had planted 2 trees in the back garden, one for Brendan Bjorn and one for Declan. There was even a concrete ramp leading up to the door for Brendan. I felt secure, content, and established in a home of my own. Now, the home is long gone, lost to foreclosure and bankruptcy, along with the career, along with those 2 trees which by now are probably so lovely and big. Now, I rent a drafty house that needs repair, with no lease and no security, and I wonder will I ever know that security of having my own home again. Once upon a time, I felt like I was making a difference in the world, working as a counselor with children every day to make their troubles a bit less and their understanding of life a bit deeper. Now, often trapped in my home for days on end caring for my precious, fragile son, I frequently wonder if I make a difference for anyone but him. And once upon a time, I had a deep, unmet dream of being a mother, knowing only the terrible heartache of numerous miscarriages and near surrender of that most powerful of dreams. Now, I live my life for not just one, but two, amazing sons who give me purpose, inspiration, motivation, a reason to live, and who hold my heart with the greatest of loves. Yes, once upon a time, things were so very different. Today marks 27 years since I lost my mother to cancer. She was only 60 years of age, and I had just turned 24 a few months prior to her death. To this day, I want her to be at the other end of the phone…or the other end of a loving embrace. Even though I have now lived more of my life without her than with her, I still need her. Do we ever stop wanting the love and guidance of our mother? I can only speak for myself when I say no. I stopped living with my mother when I was 9 years old, my parents having divorced a year earlier. It was a very dysfunctional family, that is certain. Both parents were alcoholics, life was filled with neglect, abuse, untreated mental health issues, and a carpet with plenty swept underneath its tattered edges. Yet, as I look back upon it all now, I wonder if those many challenges in my early life prepared me for the journey I am on now with my son Brendan Bjorn by making me stronger…and by learning what was and wasn’t acceptable in parenting. I can’t help but think they did. I always wanted to be a mother. I suppose that is typical of most little girls. My journey to finally become a mother – like many other things in my life – had a few bumps along the way. Before finally having my first son, about whom this blog is centred around – I had 4 miscarriages. The last one was a little girl who had Down Syndrome. Her heart stopped in utero at 3 months gestation. Then, in between having my two beautiful sons, I had my 5th and final miscarriage. And one day, I will have to also let go of my angel on earth, Brendan Bjorn. Again, I wonder if those many losses prepared me for the journey I am on now with my son. And again, I can’t help but think they did. Mother’s Day is fast approaching, so with today being the anniversary of my own mother’s passing, and the thought of soon celebrating being a mother, I am wondering many things. I wonder how my mother would have handled all of Brendan’s complex medical conditions as a grandmother? What would she have said to me over these past 12 years of his life? Would she have been proud of me? Would she have been proud of her grandson and sent him birthday cards and Christmas presents, unlike other members of my quite sparse and estranged family, or would she have also presumptuously assumed that he doesn’t even know what day it is so never bother? Would she have photos of him up on her wall? Would she have asked me to hold the phone up to his ear so he could listen to her say I love you, Brendan? So many questions that only my heart can attempt to answer. My dream to be a mother first came true with Brendan Bjorn. 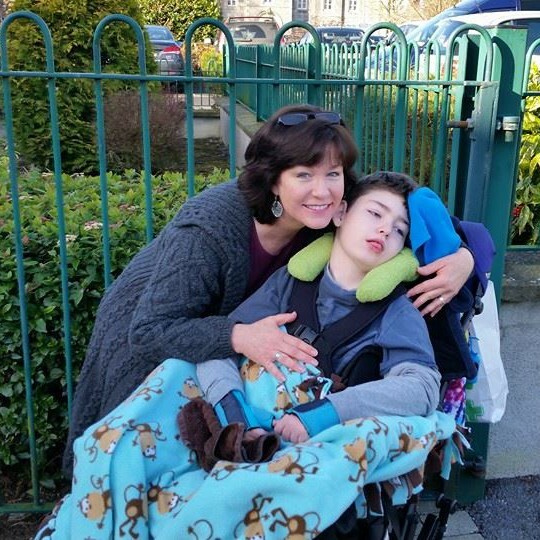 And every day, 12 years and counting, I care for his physical needs as if he is still a baby – changing his nappies, giving him baths, feeding him, dressing him, wiping drool from his chin, speaking for him, and so much more. I am proud to be his mother. With every fibre of my being, I am proud and absolutely blessed to have him as my son. Being a mother isn’t always what we dreamed it would be. In some ways, my own mother taught me that lesson. We are sometimes forced to let go of those naive childhood dreams, and replace them with a vision unlike anything we had considered possible before, such as when we become a mother to a child with severe disabilities and/or a life-limiting condition. Brendan Bjorn taught me that powerful, soul-changing lesson. We can, and we do, learn to dream new dreams. how to dream new dreams. I’m not amazing, but my son Brendan Bjorn is extraordinarily amazing. He brings to the world the rare opportunity to experience true unconditional love. By being in your life, he brings the potential for you to learn empathetic patience, to develop deep spiritual gratitude, to examine your faith in God, the world and humankind, and ultimately, he brings you…me…to the hardest lesson one will ever be challenged with – how to one day let go of their own precious child. I’m not amazing, but my youngest son, Declan, is incredibly amazing. Last night while he lay in his bed and I was giving Brendan Bjorn his medications, out of the blue Declan said, “Brendan is very special. I don’t know why the government makes you fight so hard just because Brendan is different. Sure, different is actually special.” Out of the mouth of babes. Declan is only 8 years old, but as Brendan’s younger brother, he has seen a world most people can’t even fathom. That world presents challenges, but it is also molding him into the most compassionate of souls I know. I haven’t stopped thinking about his precociously insightful comment since he said it last night. What a treasure he is, just like his brother. Crying behind closed doors whilst down on my knees wondering how I am going to continue doing this level of care as a lone parent with far too little assistance. I don’t have an answer to that question. All I know is that I can’t keep quiet any longer. I am sinking in the abyss that is this life caring for a severely disabled child with profound care needs. I cannot allow myself to sink, for my boys would go down with me, and that I will not tolerate. So, through my many tears, I will keep speaking up for my son Brendan to have equal human rights and a chance to live his albeit limited life to its absolute fullest potential…and for all of the children like him in Ireland who have profound care needs to have those same equal rights and all the dignity and opportunity in life that goes along with it. And, for carers like me, I will continue to speak up about our rights, too, because our own bodies are literally being destroyed, our mental health is suffering, our financial security no longer exists, and our personal and professional lives are often shattered into many tiny bits that trail behind us as each year passes. I am in chronic pain; I struggle with depression and anxiety; I eat foods for comfort that I shouldn’t eat; I am often trapped inside my house for days on end caring for my son; I don’t get the chance to get time for myself to recharge, centre myself, or remember the woman that I was; I cry far too often; and I frequently feel unheard, unliked, and ignored. No, I am definitely not amazing, but I do believe we are all given certain opportunities in our life to do something amazing; to facilitate changes that will be amazing for other people’s lives, if not our own. Whether we take up that opportunity or not is up to each of us. May those public servants who have the power to create the changes that would so positively affect the lives of our country’s special families, take up that opportunity to do something amazing. In case words fail me: What I really want to say to the powers at be. One of the downfalls of being a writer is that, sometimes, attempting to verbally express what is on the mind doesn’t work so well. Tonight (8 March 2017) I will be on live television to talk about being a full time carer to my beautiful son, Brendan Bjorn, who is severely disabled with a life limiting condition that leaves him medically fragile and completely dependent on me for all of his very profound care needs. So, in case words fail me, this is what I really want to say. “What I don’t want: I don’t want to hear from any Minister that it is not in their remit. I don’t want to hear that proper care and services for my son is “subject to available resources.” I don’t want to hear any spin or how the matter will be looked into or how you will do what you can. I want action. I want positive reforms. I want you all to remember that serving the people is why you were elected. And by God, my son is just as worthy of your attention as anyone else. Yet both he and I, as a carer, are left to try and eek out an existence on what amounts to €1.46 per hour for the 24/7 nursing level care I provide. Please, hear that figure again. And now tell me, would you do your political job for that wage? I didn’t think so. Do I sound angry? Should I apologise for my angry-toned message? Yes, in fact, I am angry. No, I will not apologise. I won’t apologise because I am fighting for the rights of my disabled son – and for the thousands of disabled children I know across this lovely island of ours. I am fighting for carers (like me) who are working tirelessly despite being so exhausted they often cannot think straight; whose bodies are breaking down (like mine) with the daily lifting and care of their disabled child; who are in chronic pain (like me), but continue anyway; who cannot afford the wheelchair accessible van or proper accessible ramp (again, like me) so must resort to depending on the graciousness of the public via fundraising campaigns. And I am fighting for the parents who know they will lose their child one day, just as I will, but who in the meantime want to make every moment for their angel as potential-filled as possible…but cannot afford it. I ask you now, our elected representatives who have children, to think on them at this point. Now, I ask you to imagine that one of them will die. Yes, I said that horrible, unthinkable, devastatingly painful thought. IT IS A FACT I LIVE WITH DAILY. And, it is a fact that my youngest son lives with as well. Yet we have no access – let me restate that – we have no free access to a qualified mental health professional as we live this life filled with palliative care, seizures, and steadily declining health of a little boy we so desperately love. A fair, equitable wage (not social welfare) for the nursing-level work that I do…and I want it to be pensionable because currently carers like me have no security for our future. Access to free, qualified, mental health counseling for the family. Financial assistance, such as other EU countries provide families like mine via grants, for a wheelchair accessible vehicle. An accessible house with a modified bathroom so my son will be safe rather than me carrying him into the bath and setting him on an ill-fitting bath chair set precariously into the bathtub; hallways and doorways wide enough that I don’t have to constantly struggle with his wheelchair and could actually use the hoist that now sits uselessly at the end of the narrow hallway. Equality and fair, basic human rights. Families in my world wonder if our children have them. More to the point, we know that they don’t. In this current political climate, is this how you want our families to feel about our special children? And for all of the families who have adult-aged disabled children that they continue to care for, even after 20, 30, 40 years, they need proper, high standard, residential care centres for their adult children to live a full, well-cared for life. My son will never reach that stage, but I do hear the plight of these long time carers, and they must be heard, too. If I could get anything I wanted, it would be to magically heal my son, Brendan Bjorn. But, obviously, I cannot. So what I ask is that for the remainder of his precious life, he be able to have the care, the access, the services, that he so rightly deserves…and that I, as his sole, full time carer, have the supports and means to give him all that he deserves, in this limited amount of time that I have been blessed to have him. So, that is what I would say as I looked down at my angel boy sitting next to me, surrounded by the Deputies who know me and support me, while I faced the Ministers who do not know me. I might even be inclined to take my fragile, 33 kilo, nearly 5 foot long son out of his chair and place him on the lap of one or two Ministers in hopes of evoking empathy. Unless, that is, they want to accept my long-standing invitation to come to my home for 24 hours and do a round of caring.